As horses age, their dietary needs change; some equines may have trouble gaining weight while others become obese. Their teeth may wear down or fall out, making chewing difficult. The ability to absorb nutrients from feed may diminish, as well. Saliva production diminishes as a horse ages, so moistening his feed is a good way to assist his eating. Ensuring he has water nearby will also help as he eats hay. Digestion efficiency also decreases, which can lead to diarrhea, which can cause weight loss and electrolyte imbalances. Provide senior feeds, which are designed to be easier to chew and digest. Add Vitamin C, an antioxidant and antihistamine; Vitamin C is also necessary for collagen production. Supplement with Vitamin D in the winter to keep equine bones, teeth and muscles healthy. Include Omega 3s in the diet. Omega 3s support immune function and reduce inflammation in joints, as well as promote healthy skin and hooves. Omega 3s also help regulate blood insulin levels. Feed the horse's hindgut microbes with pre- or probiotics, which digest fiber and form fatty acids that become calories and energy. Avoid feed high in starch, which can lead to equine Cushing's disease. 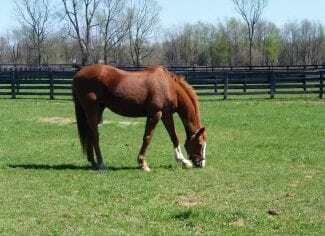 This entry was posted in Horse Care and tagged antioxidant, diet, dietary, equine, horse care, older, older horse, Omega-3, vitamin C, vitamin d by Paulick Report Staff. Bookmark the permalink.